True chic lies in the subtlety of details. Regular blouses are passe. 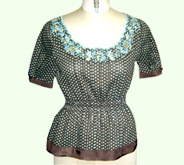 Here at Sunlord, we have all the latest designs and styles of blouses- some with great cuts, some with sprinkling of glint, some even with unimaginable finishings and looks. Our styling is hip and comfortable. We offer stunning and detailed designs. We have many different deigns of necks to choose from. The collection is lovely for everyday wear and something for that special occasion. Desc : Portraying the enthralling embroidery of flowers & leaves on the bottom, these half sleeved embroidered blouses are widely appreciated by our worldwide valued customers. Desc : To feel the touch of perfect comfort and timeless beauty, these full sleeved & V- necked fancy blouses are worth to purchase. 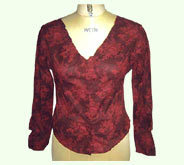 Red patterns on maroon fabric decorate them. 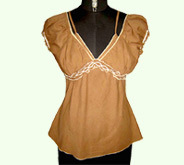 Desc : Ladies blouses have been beautified with stripe and other enchanting designs of different colors. These blouses are possessed with half sleeves and keyhole neckline. Desc : Excellent to show modern lifestyle. 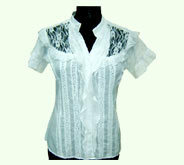 Blue & white motifs of flowers make these designer blouses eye catching pieces of artwork. Black borders on sleeves & bottom look smashing on net fabric. Desc : Perfect to be worn on formal as well as informal occasions. These charismatic fashion blouses are preferred by many owing to their spectacular durability, worth watching designs and appealing look. Desc : Superb for homemakers as well as working women. Quality and style have been appealingly combined by our zealous and well versed craftsmen in these cap sleeved women's blouses. Desc : Fashion staple for club goers, dance lovers & style conscious girls. 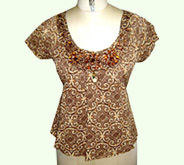 Depicting the bewitching leaf patterns on brown fabric, these glamorous spaghetti tops provide the wearers a western look. 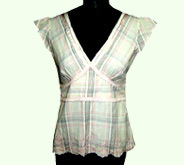 Desc : Ladies fashion blouses are attractively graced with multicolored stripe patterns all over. 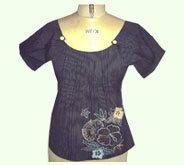 They are possessed with cap sleeves and V-neckline to exude the feel of sophistication in the surroundings.